“Compared to other problematic room issues such as signs of smoking or lack of cleanliness, evidence of bed bugs is more likely to cause guests to switch hotels and seek compensation,” concluded hosts of an online survey regarding the effects of bed bugs on the travel industry. Jerrod Penn, Wuyang Hu, and Michael F. Potter, doctoral student and professors, respectively, at the University of Kentucky conducted a survey to more than 2,000 Americans to gauge an overall view of travelers’ likelihood to move business at the sign of bed bugs. The random selection of survey takers included folks that traveled for leisure and folks that traveled for business at least seven nights per year. The results of the study showed a few important pieces of information that hoteliers need to take very seriously, including the general lack of knowledge of bed bugs and other pests, the damage social media can bring, and the absolute need for bed bug prevention in Seattle. The study showed that about 35 percent of business travelers correctly identified a bed bug, while only 28 percent of leisure travelers could pick out the bed bug silhouette compared to an ant, termite, louse, and tick. Many travelers have never encountered bed bugs, and the majority have only heard about them in the news without any personal experience or experience of friends and family. The use of the Internet can be both fruitful and damaging. People can find a local hotel and read reviews. This is great for business if the reviews are positive. However, a few bad reviews can severely impact a hotel’s business, especially when pests may be present. Moreover, travelers indicated that in an effort to avoid a pest-ridden hotel, they are most likely going to read what other guests have to say about the place. They find that information online. There are many review sites out there that lets users post any type of review, even ones with false accusations. Remember earlier when we mentioned that many people can’t properly identify bed bugs? There are countless cases of bad reviews posted about a hotel that claim bed bugs that just aren’t true; hotels can respond to the reviews, but the damage has been done already. The survey solicited opinions about hotel room issues and the travelers’ next steps. With answer options such as do nothing, report, new room, or switch hotels, participants were given a variety of issues, including signs of smoking, spots on mattress, foreign material (including blood), signs of bed bugs, dirty bathroom, or dirty towels or sheets. The results showed that 60 percent of guests that found (or thought they found) a bed bug were likely to leave the hotel entirely, as opposed to foreign material, the next highest reason to jump ship, coming in at just 23 percent likely to switch hotels. In an effort to prevent these travelers from switching hotels or posting bad reviews, we recommend doing thorough bed bug prevention to take away all reasons for guests to stray because of pests. 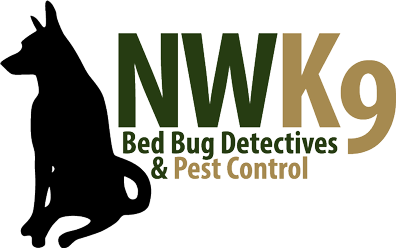 Northwest K9 Bed Bug Detectives offer Cimi-Shield, a bed bug prevention spray. Seattle residents, among many others in the U.S., are likely to choose a hotel that advertises for bed bug protection. Join the group of hoteliers that care about retaining customers that enjoy a clean, protected room. You can read the full report by clicking this link below or visiting our News page.